Pianist and teacher Tobias Matthay (1858-1945) believed that science could unlock the secrets of artistic success. Thus began a program of musical instruction and writing on piano technique that bespoke his reverence for observation and reasoning in the playing of piano. His students would later include major concert pianists of the post-World War I era—York Bowen, Dame Myra Hess, Sir Clifford Curzon, Harriet Cohen, Eileen Joyce, and Dame Moura Lympany—who advanced British pianism in the 20th century. In England's Piano Sagenow available from Scarecrow Press scholar and pianist Stephen Siek tells the story of Matthay, who began teaching at London's Royal Academy of Music in 1880 and two decades later had so many students that he had to open his own piano school in London. After World War I, student enrollments approached 500, and for a brief time, no conservatory in the world was nurturing so many finished pianists. By 1925 his towering status in Britain reached across the Atlantic with the founding of the American Matthay Association and the adoption of his ideas by teachers at Yale and Juilliard. From these heights, Matthay's reputation would experience a precipitous fall, from his forced resignation from the Royal Academy, to the barrage of criticism attacking his theories. Rich in detail, Siek's book chronicles the personal and professional story of a remarkable man whose monumental achievements now largely lay forgotten but clearly deserve a second look. In this comprehensive biography, Siek offers a modern reassessment of Matthay's contribution, exploring not only the great piano theorist's life but also his musical compositions, writings on piano technique, relationship to the Royal Academy of Music, his successful piano school on London's Wimpole Street, and the many world-famous pianists he would come to train on both sides of the Atlantic. All material on this website is protected by copyright. 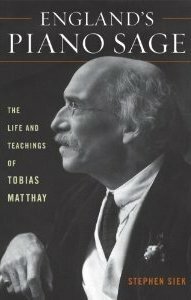 No text, and especially no excerpts from England's Piano Sage: The Life and Teachings of Tobias Matthay, can be reproduced in any form without written permission from Scarecrow Press.